100% Rye and Fruit make for a tasty tart beer. Along with brewing moderate and higher gravity beers, I’m in search of interesting, drinkable, very low gravity beers to help with cutting calories (and preserving sobriety) while satisfying my beer thirst. Brewing with 100% rye has been one technique I’ve found to give me low alcohol and substantial body. A few months ago, I decided to combine this all-rye approach with wort souring and the addition of fruit. Let’s begin at the beginning. To six gallons (23 L) of filtered water, I added 5.0 pounds (2.3 kg) crushed malted rye. 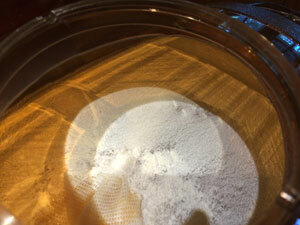 Using Brew in a Bag, I rested this thin mash at 150˚F (65˚C) for an hour. After removing the grain, I brought the wort up to 180˚F (82˚C) for fifteen minutes to pasteurize. I didn’t want any of the microorganisms on the grain to have any effect on my souring process. Probiotics – good for your gut and your tart beer. 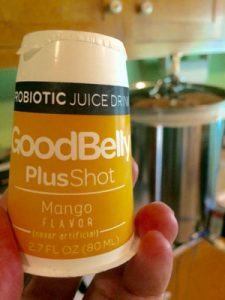 Following pasteurization, I cooled the wort with an immersion chiller to 120 °F (49˚C) and transferred to a five-gallon (19-L) carboy, adding two Goodbelly Plus Mango Shots (80 mg each) – a probiotic containing Lactobacillus plantarum. In this product, it’s supposed to help your digestive processes, but homebrewers have found that it is good for souring wort. I filled the carboy to the top to avoid oxygen contact and put on a stopper and airlock. The carboy sat for six days at room temperature. In the past, I have used my electric brewing system to maintain the temperature of wort soured with a commercial lacto strain at 120˚F (49˚C) for a few days. However, I had read accounts on the Milk the Funk Wiki that the Goodbelly Shots worked without such special attention. Others have found that their worts soured more quickly than mine. I’m wondering if the lower specific gravity had anything to do with the slow progress. I don’t have a pH meter, so I tasted the wort periodically by thieving with a clean plastic straw. When the wort tasted sour enough for me, I racked back into my brewing system and brought it back up to 180˚F (82˚C) for another round of pasteurization. I wanted to kill the lacto before transferring to fermentation. I held at pasteurization temperature for fifteen minutes and placed a hop bag into the wort with three ounces (85 g) HBC 366 (Equinox) hop pellets, squeezing the bag occasionally to encourage hop extraction. Then, I chilled to pitching temperature, transferred to a fermenter and added a packet of Safale US 05. Cherries for one, mango and peach for another. Three weeks later, I bottled six bottles of the plain tart beer, using priming sugar tablets to prime. Original gravity of the beer was 1.024. It finished at 1.010 for an ABV of 1.8%. I split the remainder of the beer between two Mr. Beer fermenters, adding two cans of Oregon Tart Cherries into one. 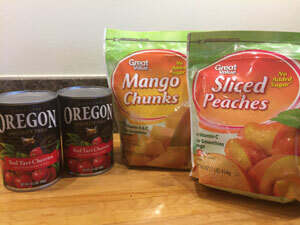 Into the other, I added one pound (450 g) of mango chunks and one pound (450 g) peach chunks. I found the mango and peach chunks in the freezer section of the grocery store. The fruit was added into cotton grain bags that had been sanitized with iodophor solution. Two weeks later, the peach/mango fermenter had developed a pellicle. I consulted with Mad Fermentationist Mike Tonsmeire, and he advised it was probably okay. Perhaps it was a bit of wild yeast on the mango or peaches? I bottled, again priming with priming sugar tablets. The peach beer was golden, while the cherry beer had a pinkish hue. Steve Wilkes and I tasted these beers on our Halloween episode of Basic Brewing Video. We found the non-fruit version to have a nice level of mango flavor from the hops alone. 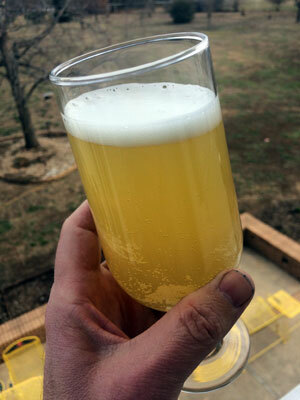 In fact, the addition of the mango to the second beer seemed to mute the hop flavor a bit. The peach, however, did stand out in the beer nicely. The tart cherry version was tasty, but it was our least favorite of the three. I sent a set of the beers to Tonsmeire for a tasting on an episode of Basic Brewing Radio. After the recording, Mike was kind enough to use his pH meter to take readings of each. 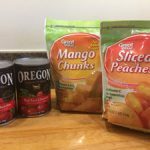 The plain had a pH of 3.32, the cherry weighed in at a pH of 3.38, and the peach mango stood at a pH of 3.44. I enjoyed the process and the beers. The gloppiness of rye makes for a substantial mouthfeel, and the tartness combines well with the hop and fruit character for a very refreshing beer. I want to get a pH meter before I brew the next tart beer. Also, if I were to do it again, I’d split the batch – half plain and half with peaches. I’m looking forward to warmer weather when beers like this will be very welcome.